Holy cow, that’s cute. According to the article, the dad couldn’t manage to keep the baby awake while waiting in line for Santa, so he asked to go ahead and take a sleeping shot. And presto, with the help of a truly excellent Santa, the result is a picture which is way more wonderful a keepsake than anything they could have produced with their eyes open. This picture feels like a lesson to me. It’s a serene scene, but you know that if the lens widened, we’d likely see a very overstimulating place. I think of those before-photo moments, with the parents trying to keep the kid alert, the war between the desire to document that very first Christmas and, well, actually surviving that very first Christmas. All of which reminded me of my own experiences. And I’m speaking as someone who once stuffed her completely-asleep one-month-old into a plush jack-o-lantern costume and paraded her around the neighborhood because I didn’t want to miss any special moments. I was remembering how great my children were at sleeping during the day and how poor their sleep performance was at night, and how so much depended on timing things exactly right. I was remembering my own attempts to navigate all of this while enjoying all of the holidays I’d loved as a kid and wanted to share with my own family, and I remembered that it could be tough. Given that context, this photograph illustrates some serious parenting wisdom. Parenting often feels like a challenging spiritual practice, and one huge example of that is parents’ utter lack of control. On one level, there’s that fear of catastrophe, that there will be a previously undetected brain aneurysm, an abductor, a terrorist, a drunk driver, or a lightning strike. But there are so many smaller things that you just can’t control. I really can’t make my kids love a musical instrument, get excited about my favorite book, wear a shirt that I thought that they’d like, or enjoy tomato sauce. They’re their own people. Sure, I’m the parent, so I can punish them if they’re being unkind or disrespectful and I can nag them about homework or discarded socks, but ultimately, they’re in charge of themselves. Choosing battles, knowing when to step in or step back, can be confusing and exhausting. And, really, so can the holidays. Because parents each have their own childhood memories and extended-family joys and challenges, and ideas about what a holiday “should” be as they’re growing a family. And then the damn kids have their own thoughts about what they value and what makes this time of year special, too. Or, sometimes, they just need some freakin’ sleep. 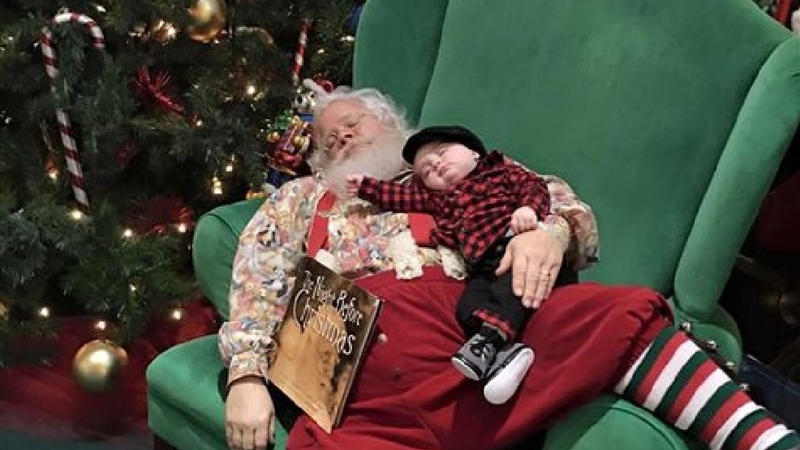 So what I like about that picture is that the parents didn’t fight newborn sleep, a recipe for misery if e’er there were one, and they didn’t grudgingly concede defeat, giving up to go buy a hot pretzel or standing next to Santa with the sleeper (which I’ve totally done). Nope: they went all in. They embraced it wholeheartedly and found some surprise joy. In the holiday rush, that’s a talent. Pausing, looking around, re-adjusting, appreciating. Like stopping when you stumble upon a choir sing in the train station or running outside into the first snow, even if it’s not on the list and you have places that you need to be. This year, I hope that I have the wisdom to scrap the plans and go where the kids and a little bit of Christmas wonder take me. Awesome sentiment. Super Santa. Priceless photo.